No matter what kind of operation you oversee—whether you’re in construction or chemical engineering—you know that business has a way of evolving. Today you need more space. Tomorrow you’ll have less budget. Next year you might be developing an entirely new product line, or setting up shop in a new city. Conex boxes are helping companies tackle challenges like these and more. Once considered just an efficient vehicle to transport freight across the ocean, Corten steel conex boxes (or shipping containers) are now highly valued for their land-based utility as strong, portable structures. They’re making appearances at tradeshows, tailgates, urban farming centers, and pretty much anywhere else with a flat surface and a business need. 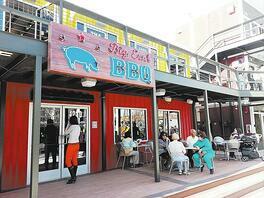 Shipping containers have lots to offer the hospitality industry. You’ve probably heard of pop-up hotels, which can crop up around temporary venues (like an Olympic park), and be relocated after an event. But what about full-scale, permanent lodging facilities? Believe it or not, shipping containers make sense for this type of hotel construction, too. Last month, an Ontario Days Inn was completed, using 120 Conex boxes as the primary building material. In a region where winter temperatures average between 12 degree and -5 degrees Fahrenheit, any opportunity to expedite construction is always welcome. And while the container infrastructure will be completely invisible to Sioux Lookout’s hotel guests, owners say that Conex boxes reduced the overall construction time from 30 months to 13 months. The boxes also helped to contain costs in a big way. Downtown Vegas’ Container Park is one of the coolest, sexiest examples of Conex boxes being repurposed for new business goals. The shipping containers (43 to be exact) in this commerce area not only house shops and bistros, they also support a functioning elevator tower and a giant playground slide. Restaurants first started using shipping containers to create storerooms for dry goods, but once people saw their versatility containerized restaurants took off. From boutiques and barbecue, to wine on tap and liquid nitrogen sorbet, Container Park has a little bit of everything—with “little” being the operative word. See how these owner-operated businesses are experiencing so much success in just 300 square feet of space. And don’t be surprised if city planners in your area start considering commercial containers to revitalize local shopping or dining. Overcrowded classrooms are a problem all across the country. Earlier this school year, one South Bronx elementary school packed 257 students into a space that was only intended for 57. That puts the Walton Avenue School at a whopping 451 percent of its true capacity. And New York City is hardly alone. Thousands of brimming school districts rely on “portables,” prefabricated buildings or trailers that attach to existing school structures, and often create a handful of problems. Poorly designed/constructed models tend to invite ceiling leaks, poor ventilation, odors, even skin reactions. But in Costa Mesa, California, one school recently added 10,000 square feet of classroom space by designing its addition around shipping containers. Each new classroom involved four Conex boxes. The two-story auditorium is comprised of nine recycled shipping containers, too. At a time when millions of unused Conex boxes are clogging up ports from Long Beach to Savannah, recycled building materials have become a smart and responsible trend. Shipping containers for classrooms are also cost-effective. The Costa Mesa builders estimate that they saved between 10 and 20 percent by completing the Waldorf School project with containers versus traditional construction methods. What Business Challenge Do You Want to Solve with a Conex Box? At Falcon, we’re extremely interested in helping companies and organizations achieve big things with modified containers. We’ll keep sharing our industry solutions. And we hope you’ll keep inquiring about yours. If you have any questions, give us a call at 877-704-0177.